Wintertime is the ideal time to prune fruit trees. Although fruit trees can be pruned in the spring and summer as well, wintertime is actually the perfect time. In winter, trees are in a stage of dormancy. During this time, there is little to zero stress when trees are cut back. And to boot, without their leaves, it it is far easier to see what needs to be pruned! Wintertime is the perfect time to prune fruit trees. Autumn pruning, on the other hand, should always be avoided. Pruning stimulates new growth. And as trees prepare for winter and head into dormancy, the new growth is detrimental to a tree’s health in several ways. With fall pruning, the new growth shoots do not have the necessary needed time to harden off before the freeze. Pruning leads to healthier trees, and a more consistent harvest. In addition, the cuts from pruning don’t have adequate time to heal either. So as you can see – winter is the way to go when it comes to pruning! Here is a look at the 4 simple steps to get those fruit trees pruned this winter! Pruning fruit trees is not as difficult and scary as many are led to believe. It is, however, an important chore to keep fruit trees healthy and productive. Trees that are left to grow unchecked are not just unsightly, they will also bear less fruit over the years. It is vital to use sharp, clean tools when pruning. Dull blades tear limbs and create stress and damage to a tree. Cleaning the blades is equally important. The metal blades and teeth on pruners and saws can easily carry disease from tree to tree. A pruning saw is good for cutting off larger branches. Wipe down with rubbing alcohol, or a 5/1 solution of water and bleach before and after use. It is also important to clean the blades from tree to tree. To tackle most pruning jobs, 3 basic tools will do. A good pair of pruning loppers, a pair of small hand pruners, and a pruning saw. 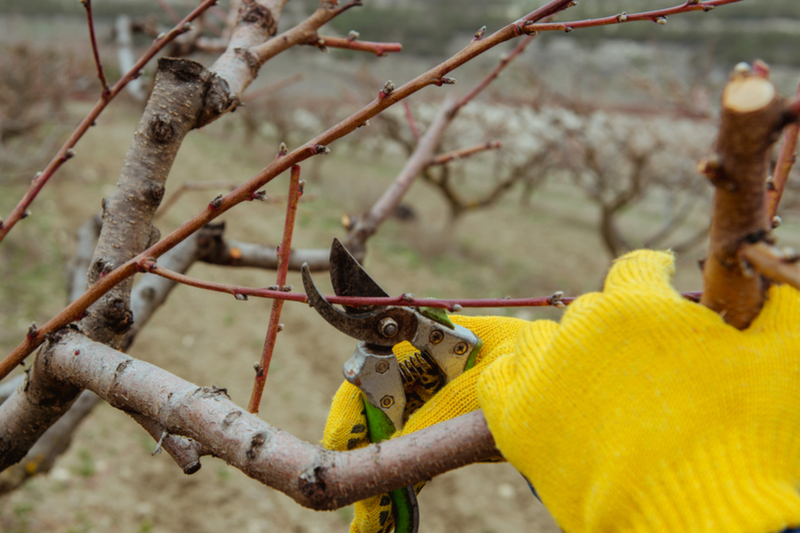 To prune fruit trees correctly, sharp blades are a must! The loppers will remove most branches that are up to a few inches in diameter. The hand pruners easily clear small shoots and starts. And the pruning saw is used for removing any larger limbs. Begin by removing any wood that is dead, diseased or damaged. The last thing you want is a tree spending energy attempting to heal damaged limbs. When clearing damaged limbs, always cut limbs back flush. When making cuts, always trim back flush to the trunk or branch the limb is attached to. Keeping all cuts flush keeps the tree from having tiny stubs. Not only are they unsightly, they can produce new, unwanted growth. Now it’s time to perform a little thinning. This is the one pruning task that causes more angst than any other. Trees, like vegetable plants and flowers, need light and air to survive and thrive. This step opens up the tree canopy to let air and light in. How To Prune Fruit Trees : Allowing light to reach through the tree is a key to success when pruning. Begin by removing branches that cross each others path. Remove the smallest or least healthy of the two crossing. Repeat this process until the branches within the core of the tree are not touching. This will allow the necessary light needed into the tree. Next, remove branches with horizontal or downward growth. These branches struggle to hold mature fruit. Branches that grow upwards or at an angle upwards are the best. They naturally hold fruit more securely. The last step is to trim back last year’s growth a bit. This helps strengthen the tree. A good rule of thumb is to take off about a quarter (25%) of last year’s growth. Remove about 25% of the new growth from the previous year. This helps to shape the tree into a nice form, and keeps it manageable. Your tree pruning is complete! All that is left is to pick up the trimmings from around trees. Your lawn mower will thank you when it comes time to mow in the spring!